Welcome! Stop dreaming about it... Come fish the Florida Keys. Imagine the excitement of being poled over the vast expanse of grass flats that cover the Florida Bay of the Everglades Nation Park. See up close all the life that lives in this shallow tidal ecosystem. Stalk tailing Bonefish, Permit & Redfish in the shallows or cruising Tarpon that travel the edges of these flats. From beginner to expert come aboard the â€œFinaddictâ€ and experience the adrenalin and challenge of Backcountry Flats Fishing. Light tackle spinning and fly fishing is my specialty. All equipment will be provided (or bring your own). Professional instruction in the art of fly casting can be giving during your day on the water Capt. Billy can also custom tailor your trip for any specific needs you might desire. Extra boats and Captains can be provided for larger groups. Normal trips are for one or two anglers but some boats can accommodate three anglers for an additional fee. Come visit me at the new â€œWorld Wide Sportsmanâ€ store and marina in Islamorada. With 20 years experience fishing the Florida Keys plus guiding every level of customer since 1993, I feel confident I can make Flats Fishing Hunt and sight cast to bonefish, tarpon, redfish and permit on the flats. Cast to snook along the miles of mangrove lined islands, creeks and channels of the Everglades National Park! 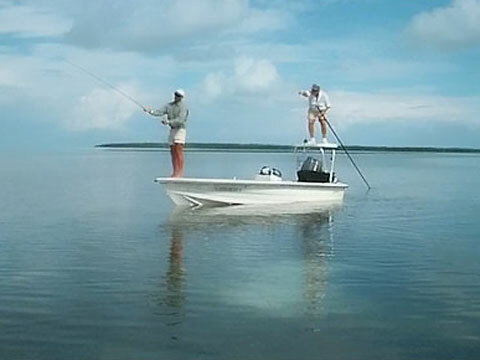 Most trips depart & return to World Wide Sportsman Marina, MM 82.5 Bayside, Islamorada. Hotel pick-up by boat can be arranged w/ prior notice (Islamorada only). We provide all Tackle, Licenses, Bait & Cooler with ice. your outing a memorable & exciting event. Everglades Canoe Trip Go back in time thousand of years, fish the Everglades for Redfish, Snook & Tarpon with either spin, plug or fly tackle. Enjoy the peace and quiet to this incredible wilderness. These are canoe accessible areas only so only one angler/customer allowed on these trips. The canoe has padded seats with adjustable back rests for comfort. I also have outrigger stabilizers for safety (when needed). Anglers only need to bring good balance & patience. These trips last 10 hours or longer depending on areas to be fished. We leave Islamorada early by skiff with canoe mounted on a custom built overhead rack, travel approximately 1 hour, anchor skiff, load canoe with tackle then depart on an adventure of a life time. Camp on the pristine beaches of the southwest coast of the Everglades National Park or on Chickee Huts located in and around Whitewater Bay. Explore areas that havenâ€™t changed in 10,000 years. Fish for Snook, Redfish & Tarpon. All necessary fishing and camping equipment will be provided for your use along with dry storage bags for your personnel items. Choose from a menu plan or we can custom pack any food item you like.